This is an international collection of ticket stubs covering the past two decades. These tickets come from every imaginable source: tickets from airplanes, trains, ferries buses, the metro, cloakrooms, and parking lots, bank and taxi receipts, inspection labels, admission tickets for museums, theatres, cinemas, circuses, operas, zoos, concerts, ballets. Organized non-chronologically but by color, the collection reprints the tickets at actual-size, one-to-one. Backe guides us through the variety of typefaces, languages, formats, styles, backgrounds, brand identities, illustrations, and other graphic elements of this sweeping collection. 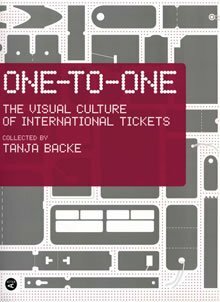 Fascinatingly small, the ticket has a unique and intriguing format that demands efficiency and utility, making the modest ticket a product of high design and ingenuity.